Summary: FT Consumable perfect for Middle to High School level students. Ideally students just starting off on their FT build days will have the whole hobby at their fingertips. First time FT STEM classrooms will typically have most students in the Build 2 Fly Learning Strand. More established FT STEM classrooms that have returning students will encounter students across the Learning Strands. For this particular set of students, the first FT scratch build they wanted to tackle and learn from was the FT-Simple Storch. 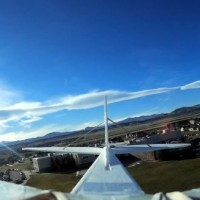 This platform is great for incorporating a lot of FT Workbench skill sets, and helps the students see the big picture for aerodynamics in shoulder bearing wing platforms. The three girls took about 3 weeks to complete the aircraft, having 2 to 3 FT build days per week. The maiden flight went great, and they went on to fly it a handful of times before shutting down the build. They removed all power equipment and placed it to the side for their next build. Two of three stayed in the Build 2 Fly strand, whereas one ventured off to Inquiry and Design.